Today was not a good day. Okay, I won’t lie. Today sucked. I don’t know what it was—maybe the fact that I woke up to lightning strobe lights through my blinds at 2am, maybe running to my car in a torrential downpour at 5am, maybe having soaked socks from 6am until 1pm, or maybe crying randomly at 2pm because I was just so freakin’ tired and overwhelmed—not sure. But today I was not in the best mood and heading into my closing daycare shift wasn’t really how I wanted to spend a Friday night. I’ve been working in what my town’s daycare calls the ‘Blue Room’ which is basically code for one-year-olds and straggler two-year-olds that haven’t moved up to the next room yet. I walked in at 3pm, which is right when everyone’s getting up from nap time and there they were: eight little half-bald heads and wide eyes just staring at me. I changed diapers. I tucked pudgy legs into highchairs. I fed them each little nibbles of cheerios, cheese-itz, and chex mix. Then I brought out the bubbles. The bubbles had been sitting on the counter next to the sink in a tiny, half-empty pink bottle. With two hours left in my shift I figured, why the hell not? I was bored, tired, and everyone likes bubbles, right? So I stuck the little stick into the soapy mix and blew out a stream of teeny bubbles. One of the older babies, *Hadley, who had been clinging to my kneecap, let go and turned toward the floating, clear circles and stretched out her arms. She was one of the cutest babies, in my opinion. One who could say words like ‘Hadley,’ ‘up,’ ‘momma,’ ‘dadda,’ ‘hungry,’ ‘baby,’ and could even count to ten like a little parrot repeating each consecutive number after you. Her tiny bald head was tilted back and she wobbled a bit on her stick legs. She was one of the older kids, but by far the tiniest out of those who could walk. She had strawberry-blonde wisps of hair and round blue eyes that made her look almost like a little alien, but she was adorable. She turned to me, expectant, as the last bubble popped on one of the little boy’s heads. Being the obedient daycare provider that I am, I blew another stream and watched her face break into a three-toothed, full cheek smile. The other babies began to participate in the bubble fiesta. 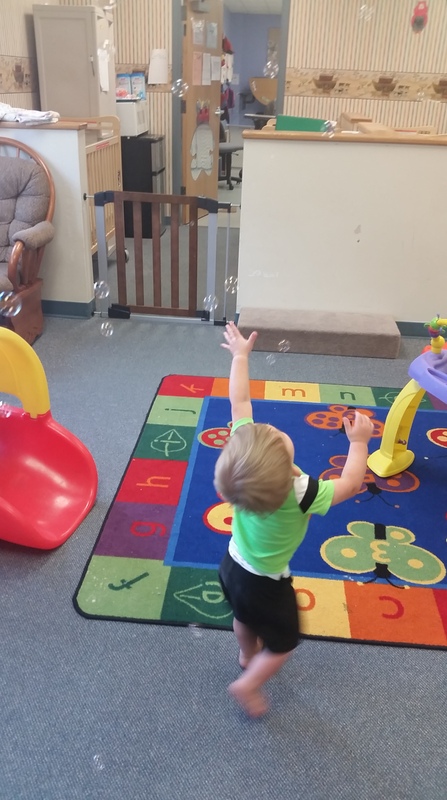 One of the boys who has spent the last two days crying pretty much any time he wasn’t being held, looked up at the bubbles and reached out to touch one. One popped right on the edge of his nose, mixing with a big alligator tear and running down his cheek. I watched the babies so captivated by the floating objects. I couldn’t help it. I smiled. I laughed too. These little humans were so amused by the simplest of things—a soft blanket, a piece of plastic, a clear circular moving creature. I remember bubbles from my own childhood: sitting outside on our concrete driveway, watching the soap mix with fresh chalk designs. I remember my first grade best friend. I remember my little sister with her button nose and toddler legs. I remember being happy. I tipped the pink container on its side and reached for more soap. I twisted the stick in my fingertips, making sure the slimy liquid had stretched across the entire circle, that it was ready. I blew stream after stream, losing track of time, just watching the smiles of my kids and forgetting what I had been upset about. Just outside the window the sun was shining, melting all the morning puddles, making all things new.